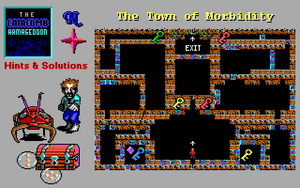 The Towne of Morbidity (aka The Town of Morbidity) is the first level (slot zero) of Catacomb Armageddon (1992). It is set inside the ruins of an ancient brick hewn settlement. "In this first level, I collect a few items, find some keys and battle zombies and giant red ants." The invocation of "chambers of secrets" pre-dates the Harry Potter novel by six years. This page was last edited on 2 July 2018, at 03:00.